Background and objectives Sleep duration has been associated with cardiometabolic risk and mortality. The health-related quality of life represents a patient’s comprehensive perception of health and is accepted as a health outcome. 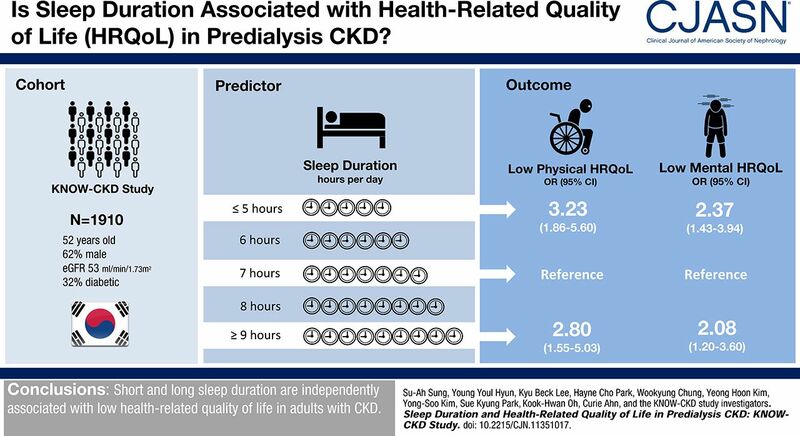 We examined the relationship between sleep duration and health-related quality of life in predialysis CKD. Design, setting, participants, & measurements In this cross-sectional study, data from 1910 adults with CKD enrolled in the Korean Cohort Study for Outcome in Patients with CKD were analyzed. Health-related quality of life was assessed with the physical component summary and mental component summary of the Short Form-36 Health Survey. Low health-related quality of life was defined as a Short Form-36 Health Survey score >1 SD below the mean. Using a generalized additive model and multivariable logistic regression analysis, the relationship between self-reported sleep duration and health-related quality of life was examined. Results Seven-hour sleepers showed the highest health-related quality of life. We found an inverted U-shaped relationship between sleep duration and health-related quality of life as analyzed by a generalized additive model. In multivariable logistic analysis, short sleepers (≤5 h/d) had lower health-related quality of life (odds ratio, 3.23; 95% confidence interval, 1.86 to 5.60 for the physical component summary; odds ratio, 2.37; 95% confidence interval, 1.43 to 3.94 for the mental component summary), and long sleepers (≥9 h/d) had lower health-related quality of life (odds ratio, 2.80; 95% confidence interval, 1.55 to 5.03 for the physical component summary; odds ratio, 2.08; 95% confidence interval, 1.20 to 3.60 for the mental component summary) compared with 7-hour sleepers. Sleep duration had a significant U-shaped association with low health-related quality of life. Conclusions These findings suggest that short or long sleep duration is independently associated with low health-related quality of life in adults with CKD.